Burke Museum | Are We There Yet? As the cool air begins to chill the nights, the annual ritual of my wife’s blood-curdling screams fill the rooms and shatter the otherwise mostly peaceful ambiance that hangs about our rural county home. Is she susceptible to the grisly nature of horror films that profilgate the airwaves and Netflix at this time of year? (Well, yes, but that’s not what causes her to scream.) Nor is she preparing for an upcoming appearance in one of the local theaters’ annual haunted house extravaganzas — although her howls would most assuredly add an air of sinister authenticity to the fright fests. No, what sends her into an apoplectic shrilly nonsense is our diminutive and oft-misunderstood friend: a spider. Like many “arachnophobes,” she firmly believes our little houseguests come in from the cold as the weather takes a turn for the worse. And up until a couple of days ago, I believed the very same myth. That is, until doing research for this blog post, I came across the Web site of a one certain Rod Crawford, curator of Arachnids at Burke Museum, on the campus of the University of Washington in Seattle. I had the pleasure of talking with Mr. Crawford on the telephone about a dozen years ago, when as a reporter, I was preparing background information on a story of a local claiming to have found a brown recluse in their home. Mr. Crawford assured me that if indeed a person had found a brown recluse, that I had a much bigger story than I intended, as no such confirmation of this particular spider being found in western Washington had yet been made. We talked at some length of some other spider myths before ending our conversation. Now I doubt very seriously that my one phone call so many years ago led him to publish his Web site (but I’ll gladly take some of the credit, regardless), but he has, since that fateful phone call, put upon the Web — pun most definitely intended — a site about the many spider myths. And there are quite a few. Just some of the myths he debunks are: You are never more than three feet from a spider; spiders found in bathtubs and sinks came up through the drain pipes; the Daddy-longlegs has the world’s most dangerous venom but it’s fangs are too soft to penetrate human skin; when black widow spiders mate, the female always kills and eats the male; some bubble gum has spider eggs in it; people are bitten by spiders at night while they sleep; you can identify a spider by a photo or by its markings — and a particularly disturbing myth, that we swallow an average of four live spiders per year while we sleep. I could go on in some detail to some of the myths vs. reality, but why when Mr. Crawford has done such an excellent job already and you can read his handiwork for yourself by clicking here? I will admit that I have heard and believed a number of the spider myths he squashes on his Web site. In particular: that spiders come into a house to escape the cold. Think about it. They are not warm-blooded so they do not react to the vagaries of outdoor temperature changes other than to die when it gets too cold. It was fascinating to read how there are in the Pacific Northwest roughly 30 outdoor arachnid species, 25 indoor species and eight that can live indoors and outside. Most of the house spiders we see have lived their entire life inside and putting them outside is most certainly a death sentence for the spider (another myth busted). 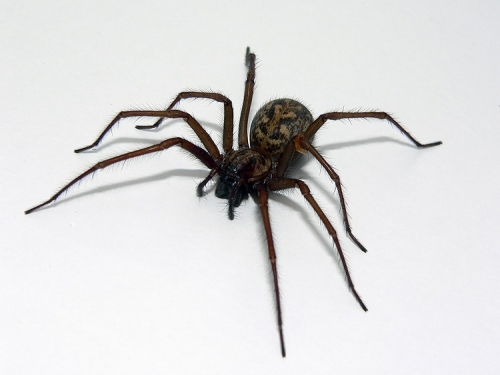 A big myth that I still have a hard time adjusting to is that spiders rarely bite and on average a person is bitten once or twice in their life. Of the thousands of spiders he has handled, Crawford claims to have been bitten only twice. So as Halloween approaches and the visible sight of orb weaver webs can be seen on virtually ever bush and tree, take time to read how misunderstood our little multi-eyed friends are. Like sharks and wolves, they have garnered an undeserved reputation amid their human counterparts. It’s time they earned a little respect for all the good they provide by keeping a pest-filled insect world in line. But that respect will stop short with my arachnid-fearing wife. She won’t even discuss a spider’s attributes and the photo I’ve attached to this post will guarantee to keep her from ever reading this blog. And my apologies to Jim Stafford’s 1970s classic, “Spiders and Snakes,” about winning love through intimidation. I loved that song as a teenager.